When it comes to properly disinfecting surfaces, dwell time is important. Dwell time (or contact time) is the amount of time the surface must remain visibly wet in order to kill pathogenic microorganisms before the disinfectant is wiped off. The surface needs to be left undisturbed. A common problem is that most products typically require dwell times upwards of 10 minutes. In a perfect world, most individuals would have the time and frankly the patience to wait around for the disinfectant to work. But we live in a far from perfect world. Ours is a world where “fast” seems to be the motto of the times. So, let’s get real for a bit. What is the likelihood that cleaning staff, who are already pressed for time, actually wait around several minutes for surfaces and objects to be properly disinfected? Let’s agree that proper disinfection might not be taking place due to the overwhelming number of surfaces to be disinfected and the short amount of time staff have to clean them. For example, think of all the desks in just one classroom. How can cleaning personnel realistically wait 10 minutes per desk even if they spray a few desks and come back to dry the first one? The answer is, they can’t. Not properly disinfecting surfaces is concerning because remember when it comes to disinfecting, the goal is to kill germs in order to reduce the risk of spreading infections. If germs are not being killed then the reality is that infectious outbreaks will occur. Clearly, dwell time is a major factor that impacts the efficacy of disinfecting surfaces. To that end, EPA registered disinfectant products are being developed with shorter dwell times. This solution is an important one so all of us can stay safe and healthy. Staff are more able to disinfect surfaces properly with products that are still effective but have shorter dwell times. In addition to dwell time, there are other factors that play a role in the disinfecting process. The CDC identified several factors in health-care settings that can affect whether or not surfaces are being disinfected properly. They also identified best practices to clean and disinfect schools in order to combat the flu. Below are some factors, gleaned from both articles, that should be taken into consideration when it comes to disinfecting surfaces and objects properly. What Pathogens Are You Trying to Kill? Clearly identifying the type of pathogens you are trying to kill is an essential step in the disinfecting process. If you are misidentifying the pathogens then the disinfecting process will not work. Accurate identification is also important because it is directly related to the next step of picking out and using the proper disinfecting product. Are You Using the Proper Disinfectant? Once you have identified the pathogens you want to kill you can correctly choose a disinfecting product. 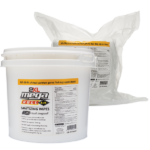 EPA registered products clearly identify the types of pathogens they kill. You can usually find this information right on the label or on other paperwork that may have come with the product. The important part here is to purchase EPA registered products so you know products will do what they say they will do. Read the label and follow the directions regarding personal protective equipment (PPE). This precaution may seem like an inconvenience but it is designed to “minimize exposure to hazards that cause serious workplace injuries and illnesses.” Since you are dealing with a disinfectant make sure to wear gloves and other PPE as instructed so you can keep safe. Check the label for directions and follow them accordingly. Make sure to read and follow any special instructions for cleaning and disinfecting pathogens on specific surfaces. Finally, check for precautionary statements that may affect humans, pets, and the environment. Does the Surface Need to Be Cleaned First? Cleaning can be a necessary first step prior to disinfecting. If you can see that there is a lot of dirt on the surface, it needs to be cleaned off prior to disinfecting it. This step can seem like a wasteful one but it removes germs and lowers their numbers. Keep in mind though if you cannot see the dirt on the surface there are products that are EPA approved to clean and disinfect all in one shot. 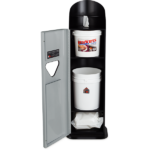 These products are efficient and effective so you eliminate the need for an additional cleaning product prior to disinfecting. Typically most surfaces don’t usually have heavy amounts of dirt. Are You Using the Proper Method to Disinfect? Another important factor in the disinfecting process is the method itself. It is easy to think that being armed with a disinfectant spray and a cloth is enough to disinfect surfaces. The problem with this method is that most people use the cloth over and over again to dry multiple surfaces, increasing the risk of cross-contamination. Worse yet, is if someone uses the same cloth to both clean and disinfect. It is easy to see how an EPA registered product that both cleans and disinfects would be beneficial. How about a product that just needs to air dry? There are many factors that play a role in the disinfecting process. They are all important and interdependent. Each one sets the stage for what really is the most important role and the heart of the disinfecting process- dwell time. If any of these factors are not taken into consideration, they make the dwell time null and void. If you are using the wrong product to kill the identified pathogens, then the dwell time again is a mute point because you are not properly killing the pathogens anyway. If you use the same cloth over-and-over again then the dwell time is useless since you are most likely contaminating other surfaces. If you are drying the surface too quickly, pathogens are most likely still clinging to life on that surface. 2XL is a leading manufacturer of effective disinfecting products for numerous industries. 2XL’s passion is rooted in providing smart solutions that a save you time and money. Force2 Disinfectant Wipes are the solution to your disinfecting needs. 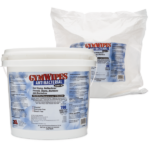 These pre-saturated wipes are EPA registered to both clean and disinfect eliminating the need for additional cleaning products. This hospital grade disinfectant is fast acting and effective enough to kill 47 pathogens including Staph, E. coli, and MRSA. It also kills many viruses as well including HBV, HCV, and Influenza A. Its alcohol-free, ammonia-free and bleach-free formula will not leave a sticky or dull residue on surfaces. With just a 2-minute dwell time you can clean a lot of surfaces in a short amount of time. The best feature: once you have applied it there is no need to wipe it dry, just wipe and walk away. 2XL is your trusted partner for effective products that both clean and disinfect. Our mission at 2XL is to create smart solutions that make the world cleaner, safer, healthier – one person, many industries, one wipe…at a time.